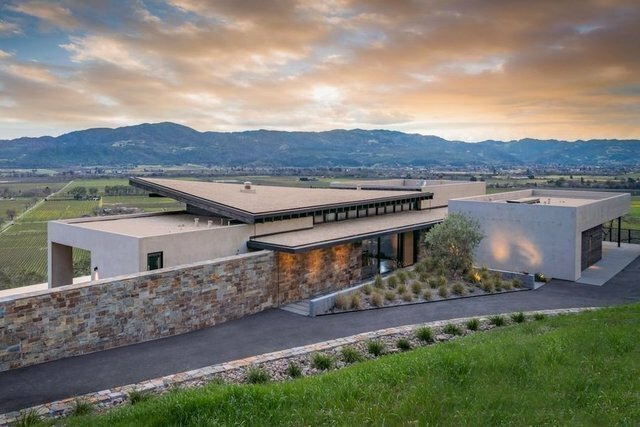 Breathtaking home nestled gently into the hillside, offers expansive unobstructed views of the valley floor and western foothills of the Mayacama Mountains. Renowned architecture firm Aidlin Darling, designed this modern aerie and open concept home.This design of luxury accentuates an indoor/outdoor palette of concrete, stone, wood, steel and glass. The exceptionally private and elevated home sits on 21 acres and is approximately 4,750 Sq Ft with 5 bedrooms and 4 baths. The great room provides floor to ceiling operable glass walled rooms that allow natural light to flow freely throughout the house. The terrace offers a long reflecting infinity pool and hot tub which offers and intimate outdoor setting that overlooks the panoramic valley views.